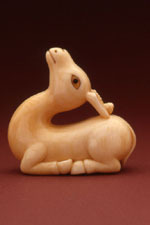 The Netsuke Online Research Center is dedicated to increasing the cultural awareness, aesthetics, and enjoyment of Netsuke and related Japanese Art Works all over the world. The project will be a library of information from the uninitiated to the expert by acquiring and organizing all relevant Japanese Art information and making it available in a readily accessible manner. Recently various questions have arisen in understanding utsushi within the art of netsuke, but no answers have been forthcoming. When utsushi of a netsuke are seen only from the Western perspective of a copy, they are viewed as uninventive and thus unworthy, as if an inspired copy is not as important or creative as an original. Unconsidered is the question that these inspired works may surpass the original in technique or style. In this instance, utsushi within netsuke could claim its own special niche. Once the categorical misinterpretations are clarified and understood in the context of traditional Japanese art, viewers can then enjoy utsushi by observing the creative continuity of an ancient tradition in the modern present.